Lead time vs Cycle time – at a basic level “lead time” for a work item includes queue (waiting) time in a To Do (or Ready) process state; it’s the time from when the work item enters the ToDo process state, progresses through the Doing process state, and enters the Done process state. Lead time is likely of most interest to stakeholders or customers, as from their perspective the “clock” started with the request for a desired work item. In contrast, “cycle time” starts when the development team “pulls” the work item from the ToDo state and begins actual “work” on it, but it includes any “wait times” too as the work item is worked on in the Doing process state until it enters the Done process state. Also, one person’s lead time can be considered cycle time by another based on the context, perspective, and the level of the work item. For example, a stakeholder may only be concerned with “feature level” work items and from their perspective a feature’s “cycle time” started with efforts to prepare the feature for placement into the development team’s ToDo queue. But from the developer’s perspective they have not “started” the feature until it is “pulled” from their ToDo queue so any time in their ToDo queue is considered part of the feature’s overall “lead time” but not part of its “cycle time.” As work proceeds, the requested feature work item is also likely broken into a set of smaller work items (ex. stories), and tracking lead and cycle times for the “parent” feature work item is done along with also tracking lead and cycle times for individual “child” story work items. In essence, any child story work item lead time is part of its parent feature work item cycle time. Another point to consider is a development team may consider a work item “done” at an earlier date than stakeholders or customers whose “done” often means in the field and may include a “warranty/bake-in time” period. Confused? Clearly, any meaningful conversation related to lead vs cycle time requires both a “basic” understanding of the difference and a shared context and perspective on when request time starts, when work time starts, when work is done, as well as what level of work item is being discussed. In many software development contexts it is beneficial to measure and track the average and variation for both the lead and cycle times for one or more levels of work items. Draw a horizontal line (run), from the point where your vertical line intersects the ToDo charted line, parallel to the time intervals along the x-axis, until it intersects the # of items along the y-axis. Where these two horizontal lines intersect the y-axis, read the # of items charted, and the arithmetic difference between these two #s is your WIP for the point in time where your vertical line is drawn up from your x-axis. In this example WIP includes work items “waiting” to be pulled from the ToDo state and work items “actively” being worked in in the Doing process state of the workflow. 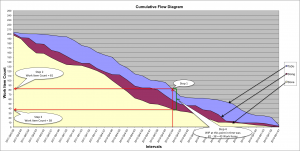 There are other ways to track and measure your WIP at a point in time, but for some, the visual form of the CFD can be an impactful (easier) way to see useful trends. However, to be clear, this exercise shows how to compute the WIP at a specific point in time on the CFD. We “read” the queue length at a point in time for the work items “in progress”, that is in our example here, the total number of work items in ToDo waiting to be pulled into Doing along with those in the Doing state already being worked on but not yet completed. This is not an average queue length for the process state over a period (span) of time. Can we get an approximate average WIP (queue length) for a process state over a period (span) of time of interest using the CFD? If so, how? Stay tuned; I’m thinking (maybe depending on response from this post) a walk-through style “deeper dive into CFD basics” post might be useful and fun to do too. In the CFD below I chose to use two-week (14 day) time intervals identified by year, quarter, and sprint # and tracked the end dates for each. So in this case I could subtract dates to get my approximate average lead time but I also can see from the chart there are nine two-week intervals (9 x 14 = 126 days). 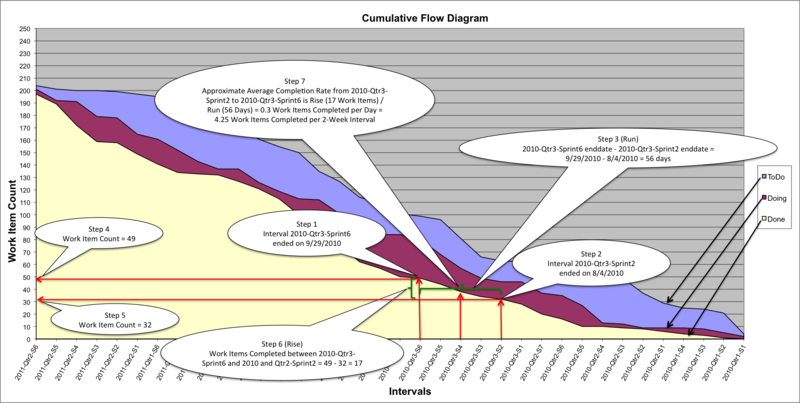 In this example, the work items that were completed by end of interval 2010-Qtr3-S4, you can see on average about half of their lead time (4 to 5 of the nine two-week intervals) was “wait time” in the ToDo state before being pulled into Doing. You can approximate “average arrival rates” (AAR) for work items at any process state in your workflow in a similar manner. For example the AAR for items being pulled into Doing from ToDo would done in a similar fashion as computing ACR above but you would use the Doing charted line rather than the Done charted line. The AAR for items being submitted into the ToDo process state would use the ToDo charted line and follow similar steps. We ended our discussion on basics of reading CFDs talking some about what we thought might be desirable to see over time in our CFDs and came up with the following. Ideally, you first like to see over time the chart lines on your CFD become more or less parallel. Why? This indicates that ACRs and AARs between the process states in your workflow are becoming synchronized, and demand is becoming inline with capacity between process states through your workflow. Why is having the ACR (capacity) and AAR (demand) closely synchronized in your process a good thing? If the above “expanded summary” from our Agile Denver Kanban SIG discussions helped you better understand the basics of reading CFDs, it would be helpful (and appreciated) to hear from you and learn how (or what is still puzzling). I’m also interested in learning if a follow-up “deeper dive into CFD basics” walking through some of the un-answered questions above and a few others like the following would be of interest or helpful for you.